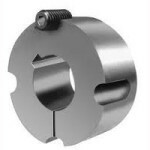 A taperlock clamping bush, also called a taper bush, is a conical machine element to provide an interference-fit shaft-hub connection in mechanical engineering. This clamping element fixes the hub of a V-belt pulley, for example, precisely in the axial center of a shaft. It already has a bore and keyway for the most common shaft diameters. They currently come in 16 sizes for shaft diameters from 10 mm to 125 mm.